This was the Michigan Central's major coal fueling facility, located approximately mid way on its double track main line between Detroit and Chicago. Locomotives on MCRR's high speed passenger trains picked up water for steam at several high speed track pans, and then stopped for coal at Augusta. The train would usually stay on the main line, pull under the tower, and then spill coal into the tender through shutes. Though this doesn't show them, this bunker likely had shutes for both main tracks as well as side tracks on either side. The small drive through structure on the right (north) side was to unload coal. 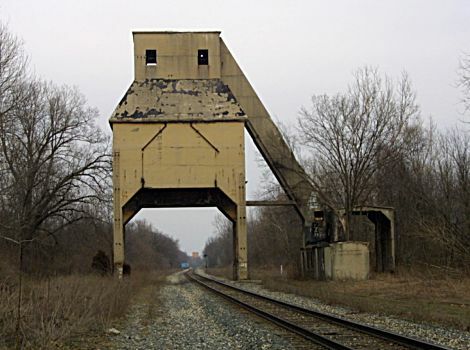 A yard switcher would bring a coal car under the structure, dump the coal into a bin below, and then a conveyer system would be used to haul it up to the top and into the main holding area. 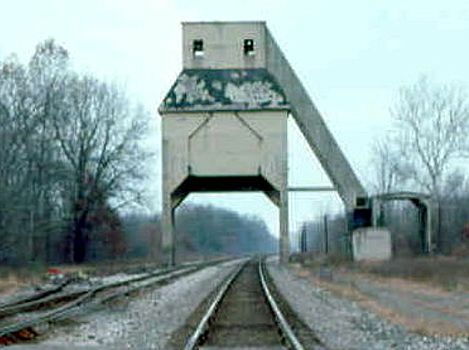 Coal towers like this one also had storage for sand (also used by a locomotive for traction), and sometimes had multiple bins for different grades of coal.